Do we know that Badagas have some exotic and unique jewellery that they, especially women, have been wearing for centuries ? It was a chance but a wonderful meeting with a nice hethe called Gange amma,aged 78 years, wife of late Kari gowder, of Kerben Village (Kotagiri) at Mettupalayam which made me ponder & wonder and also offered me the opportunity to take her snaps with the unique Badaga ornaments of nose ring and ear rings. To my great pleasure, she also has the typical tattoo on her forehead called ‘ ASALU /ASILU ‘ a tradition which is completely extinct now. She told me that the tattooing was done when she was twelve and done by her mother. The soot at the bottom of mud pots used for cooking in those days, was scrapped on the rim of a silver finger ring and the circular impression was first made on her forehead before being ‘pricked’ with a needle, she says. “ Madekkeya pitti haduva masiya belli ungaradhoge ujji nethiga haakki , adu mele soonjiya kuthidha enna awai. Appara urichidhamane krichi butte..adutha asilu ollagenge kuthule” (Since it hurt a lot I cried out in pain and my mom did not prick deeper and hence the tattoo is lighter). It is with a great sense of honour that I present her pictures to highlight the jewellery on her person. Thank you Gangamma Hethe ! Perhaps, it would be an interesting topic to research why Badagas have chosen these particular designs for nose and ear rings that have not undergone any changes in ages. 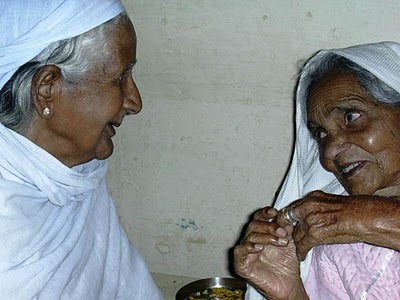 Is it due to their simple but very beautiful get up or are there some great hidden stories? Badaga women also [used to] wear a kind of chocker called “ SARATTADI “ that is a short chain around the neck with a biggish pendant. [See the pictures of many older Badaga ladies wearing this ].Then, of course is the ‘ SERUPPANIGE ‘ a silver long chain with coins fixed around. The other long chain with silver beads is ‘ GUBBIGE MANI ‘. Then, there are the anklelets called ‘ GOLASU ‘ for girls and ‘ GAGGERE ‘for boys. Are we not losing out quite a lot of our traditions and customs including not wearing our traditional dress or jewellery ??? How wonderful it would be if every Badaga lady wears our typical jewellery atleast for weddings with a white 'pattu' (that can be easily removed/carried) like the Coorgis who wear the sarees ONLY in their typical style during their weddings? Even those who have not pierced their noses can always wear a modified Badaga nose ring and lighter and smaller 'chinna', can't they? You rminded the oldest Badaga Jewellay, and it brought to me to my younger days in Hatty, where more Iyanavakka and Hetheyavakka used to wear. Now a days very rare old people are wearing these ornaments. One More Jewellary I want to note here whis is called HODETHARA, which is usually weared to one year old children, when the occation for that child's MANDE BEESUVA function. I love these different kinda jewellery... coz m a little allergic to gold. So now I hava kadaga, the bracelet which I wear very often... And I love it. Had worn it to office.. n many liked th epiece.. So was wondering if any1 knws whr i can find such jewellery now? Good to know that you like the traditional Badaga KADAGA /CHIPPU BAE. Pl send me a digital photo of your bracelet (if possible with details like size, wt etc) and I will let you know where to get it and the approx.price. Hope more youngsters like you will take interest to regain and retain our past glory. A question from Suresh of Kalhatty who had obviously seen the page on Badaga Jewellery (Badaga Bangara) has clean bowled me. His question is why do Badagas, always, wear silver rings in pairs. Does it have any special meaning? 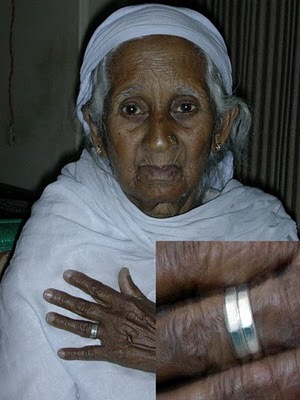 I have heard elders telling 'jodi (bellie) ungara ikku' - wear (silver) rings in pair but never really found out the significance. Anyone who can through some light?